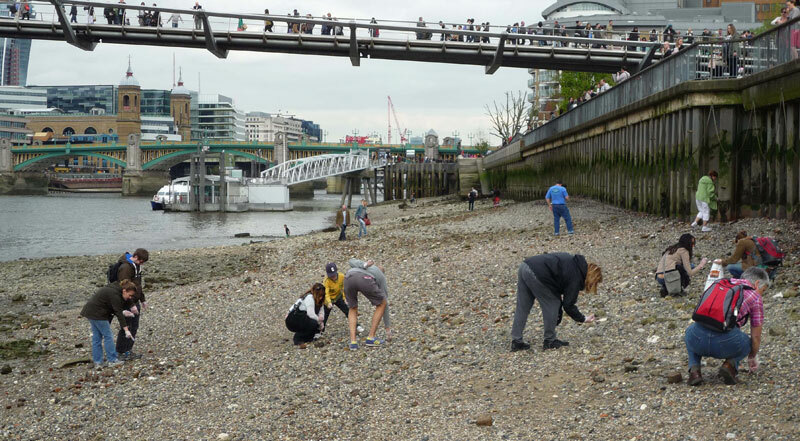 Amateur sleuths look for historical artefacts on the rocky foreshore of the River Thames at low tide during a walk led by Dr. Fiona Haughey, an expert on intertidal Thames history. Items not of significant archaeological interest may be kept by their finders. THE KNEE-HIGH rubber boots on a dry, sunny day are a giveaway that you have arrived at the right place. As you exit Mansion House station on the London Underground you might encounter a group of urban explorers, many wearing protective footwear not called for by the balmy weather. They have convened to go “mudlarking” on the River Thames foreshore at low tide, and are waiting for their guide to arrive. Dr. Fiona Haughey holds a PhD in archaeology and is an expert in intertidal Thames history. When not on a dig abroad, she guides these tours 50 or so times per year. Haughey, a jovial woman with a droll sense of humour and an encyclopaedic knowledge of local history, arrives exactly on schedule. She assembles the group, collects the modest London Walks fee (£9 for adults; children under 15 accompanied by parents are free) and explains the ground rules. Sensible footwear is a must, as are disposable surgical gloves, which she will hand out just before we go down to the river. (You don’t want to contact potentially fatal Weil’s disease, transmitted through rat urine.) Unless you possess a Thames Foreshore Permit, which takes three weeks to arrange and costs £20 for a single day, you may not use a metal detector nor dig below the surface with any implement. You may only pick up what you can see lying there, and any items of significant archaeological interest must be reported to the Museum of London. Now off we go. We spend the first hour on a meandering route, stopping several times so Haughey can deliver entertaining dissertations on London’s underground rivers, the influence of the Roman occupation, the history of the many bridges over the Thames, the various environmental crises the Thames has faced, and so on. We cross Southwark Bridge, stroll along Bankside past Shakespeare’s Globe Theatre until, finally, near the Tate Modern, pass through a gate most of us would never have noticed and descend a stone staircase to the pebbly, rock-strewn foreshore. Within seconds, Haughey bends down and picks up a small, ochre-coloured brick the size of a deck of cards. “This is a Tudor roof tile. You can tell by the shape of the nail hole,” she says. Over the years, her groups have found all manner of artefacts: pilgrim badges from the medieval period, 16th-century clay pipes discarded after their tobacco plugs were smoked, military paraphernalia and more. It takes a practised eye to find these items, and knowledge like Haughey’s to identify their provenance, which is why she patiently stands near the steps for the next few hours, explaining everyone’s discoveries. Mindful of the tide, we eventually call it a day. This is a fascinating way to spend an afternoon; even if you don’t find anything worth keeping, you get to view the London cityscape from an unforgettable perspective. And if you come here again, the foreshore will be subtly different. Roiled by the tide and the opposing current, the River Thames is constantly giving up new things to discover. Thames mudlarking tour times coincide with the river’s low tides. For details visit the London Walks website at www.walks.com. For information on London go to the Visit London website at www.visitlondon.com.